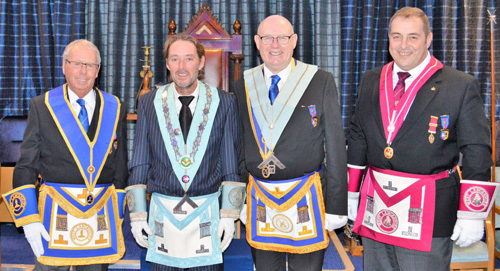 Familial ties, are an important element in life and for many Masons that extends to family links within the Craft. At the installation ceremony of Longridge Lodge No 8077, the master elect Clifton Carefoot, was following in the footsteps of his grandfather Walter Carefoot, who had been one of the 26 founders of the lodge and its first WM. In the words of Peter Pemberton, who was the principal guest for the installation ceremony, ‘he was sure to be looking down on his grandson with a great deal of pride’. Pictured from left to right, are: Peter Pemberton, Clifton Carefoot, Andrew Thiele and Scott Devine. Peter was accompanied and supported on this memorable occasion by a number of grand officers, including Tom Blackburn, Howard Jones and Jim Wilson, as well as group vice-chairman Scott Devine and acting Provincial grand officers Ian Aspden, Reg Wilkinson, Les Newlands, Barrie Bray, Graham Dowling and John Pitches. Michael Monks had the pleasure of presenting Clifton as master elect for the ensuing year, before the installing master Andrew Thiele, in a sincere and warmly delivered ceremony, placed Clifton in the master’s chair. 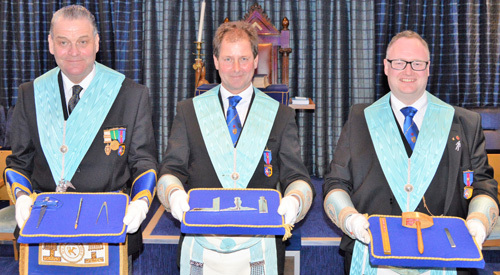 After assuming the chair of King Solomon, the new WM was presented with an explanation of the working tools of a master Mason by Neil Hartley, those of a fellowcraft by Tony Ollerton and the first degree working tools by Matthew Mason. Superb addresses to the master and wardens were given by Michael Monks and Peter Pemberton respectively, whilst the address to the brethren was given in style by Tom Blackburn. As the ceremony of installation drew to a close, Peter rose to bring congratulations from the Provincial Grand Master Tony Harrison to Clifton, the newest ruler in the Province, as well as to the officers who took part in the ceremony and especially to Andrew for all his hard work in the past year. Peter was thrilled to receive notice of donations made by the lodge to charities and good causes amounting to over £4,000. These included £800 to the WLFC, £500 to MCF 2021 Festival, £250 to Garstang Masonic Hall refurbishment fund, £1,000 to Bowland Pennine Mountain Rescue Team, £700 to North West Blood Bikes, £200 to ‘Dig in North West’, £200 to Veterans in the Community and £500 to Red Rose Recovery. The brethren who presented the working tools. Pictured from left to right, are: Neil Hartley, Tony Ollerton and Matthew Mason. At the festive board, held in the Wyrebank Banqueting Suite, Peter said he was delighted to be able to convey his own personal congratulations and thanks to the new master. He said that Clifton had been looking to the East for a little while but had now stepped out into the bright shining light which would lead him to a wonderful year. In bringing the notice of the brethren to those issues which are the closest to our Provincial Grand Master’s heart and which he deems of particular importance, Peter talked about the MCF 2021 Festival and assured the brethren that our own West Lancashire Freemasons’ Charity would not be adversely affected as it had taken prudent steps to ensure all necessary funds will remain available for the entire period of the festival. Peter highlighted the importance of the Royal Arch and how it should be the first consideration of any Master Mason before looking at any side degrees or Masonic orders. It is, he said, enjoyable, vibrant and stimulating and strongly commended joining to all those who had not already done so. Although we are the custodians of our present fraternity, we do need new and young gentlemen of the right calibre if we are to hand down to future generations the legacy we ourselves have received and Peter encouraged brethren to share the sense of enjoyment they themselves receive from their Masonic membership and to encourage suitable gentlemen to come along and join us. Peter closed with thanks to the group officers and all who had contributed to making the day such a success. Following the toast to the master by Andrew Thiele, an impressive rendition of the master’s song was then given by Jim Gibson, with accompaniment by Fred Parker. Pictured from left to right, are: John Pitches, Barrie Bray, Jim Wilson, Howard jones, Tom Blackburn, Peter Pemberton, Clifton Carefoot, Andrew Thiele, Scott Devine, Graham Dowling, Reg Wilkinson, Ian Aspden and Les Newlands. Photographs courtesy of Stewart Aimson.